Grouse Mountain belongs to the North Shore Mountains of British Columbia, Canada. Located on the outskirts of Vancouver, British Columbia, the area is a popular outdoor sport area. In the winter, the mountain features 26 separate ski runs along with an ice rink. In the summer, the park features hiking and lumberjack shows. Year round activities include the zip lines, an aerial tram, a mountain theater and a wildlife refuge. Used by NBC to headquarter their 2010 Olympic coverage, Grouse Mountain features a unique ski lodge with gorgeous views of the city of Vancouver. The Mountain top is reached by the tram or by climbing of the pathway known as Grouse Grind. Grouse Mountain map guides show the locations of these activities. Opening in December and remaining open into May, the ski areas are supported by four chairlifts and is one of the most popular places to ski in Vancouver. The mountain was named in 1894 by a visiting hiking group who noticed grouse sitting on the mountain. The mountain has grown to be one of the most popular public attractions in British Columbia. Its location less than 15 minutes away from Vancouver makes it easy to access. The selection of restaurants on the mountain include a location to satisfy most appetites. Close hotels in the beautiful wilderness area only add to this location’s desirability. There are several ways to reach the mountain parking area, according to the Grouse Mountain map. Driving time is about 15 minutes from the city. The mountain is open 365 days a year from 9 AM to 10 PM. Take the Trans Canadian Highway 1 to the Capilano Road and follow this road up to the parking area. Drive to Main Street, continue as it turns into Marine Drive, and follow this road to Capilano Road. Public transportation – Take Bus 232 or 236 from downtown Vancouver to reach the parking area. These buses run on a 30 minute cycle throughout the day. There are no hotels on the mountain. Hotels located in Northern Vancouver are less than five miles away from the mountain. Here are some examples of local hotels. Holiday Inn Hotel and Suites – One of the newest hotels in the area. The hotel features large rooms with free internet and parking. There is a lounge and restaurant on site. The inn has an indoor pool and is set in a lush garden. Pinnacle Hotel at the Pier – Located near shopping and public transportation, this hotel is a favorite of visitors to Northern Vancouver. The hotel provides bikes for guests to ride, access to a complete spa and workout facility, and has several levels of dining available at the hotel. This hotel is also next to the 2010 Olympic park and torch. Lonsdale Quay Hotel – This hotel is near the harbor area. The Lonsdale provides a comfortable room at great prices. Near all the shopping and public transportation in the North Vancouver area, this hotel is conveniently located near the mountain. There is a glass atrium on the roof for guests to view the city. Grouse Mountain restaurant locations are found at the top of the mountain. These restaurants run from snack bars to fine dining establishments. Here are some of the choices. The Observatory – This is the pinnacle of dining at a Grouse Mountain restaurant. Order from the menu or enjoy the Chef’s Five Course Taster Menu. The Observatory features a board selection of wines and native cuisine. Open for dinner at 5 PM, this restaurant serves the public seven days a week. Reservations are recommended, especially on weekends. Reservations include a free ride on the tram. Lupins Cafe – Located in the Peak Chalet, this self-serving cafe overlooks the valley. Selections are perfect for lunch or dinner, and the cafe is relaxed and personable. This is a great dining location for families with young children visiting the mountain. Altitudes Bistro – Friendly service with great views are provided at the Bistro. The Bistro features local specialties as well as hot and cold sandwiches. This is a great place to put your feet up after a long hike. Weather on the mountain peak changes during all four seasons. Fall begins in September with a cooling down in the weather to the low 40s and 50s during the day. Winter begins in December with snow falls and temperatures reaching into the teens and occasionally below zero. Spring begins in April, with the melting of the winter snows. Summer arrives in June, with temperatures in the 70s and 80s, with an occasional heat wave. Grouse Mountain weather features a full complement of outdoor challenges. In the winter, there is plenty of snow and powder on the mountain. 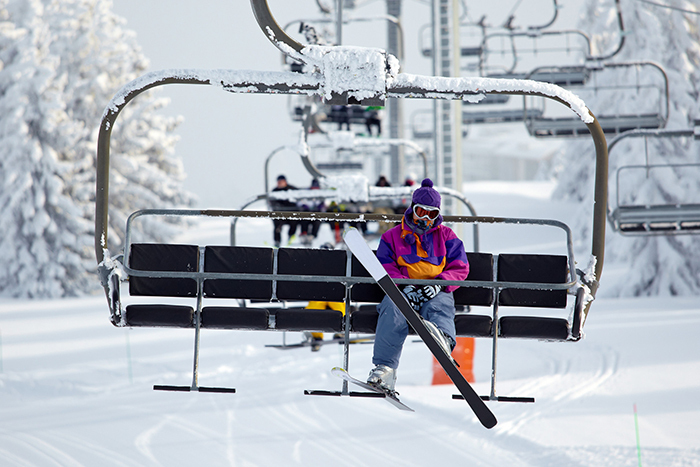 The mountain supports 26 ski runs at all levels from expert to beginner. The most famous run is called the Cut, and is at a beginner to intermediate level. These runs are reached by four ski lifts. While there is plenty of natural snow on the mountain, 37 snow guns are available to make snow. This helps even out snow during the season. The average yearly snowfall is over 26 inches. Half of the runs have lights for evening runs; skiing the mountain in the evening is a very popular activity among the locals after work. The Grouse Mountain website provides up-to-the-minute weather reports on the mountain areas. SkiVacouver.com is the best source for information on Grouse Mountain [http://skivancouver.com/grouse-mountain/], Cypress Mountain and Whistler BC.